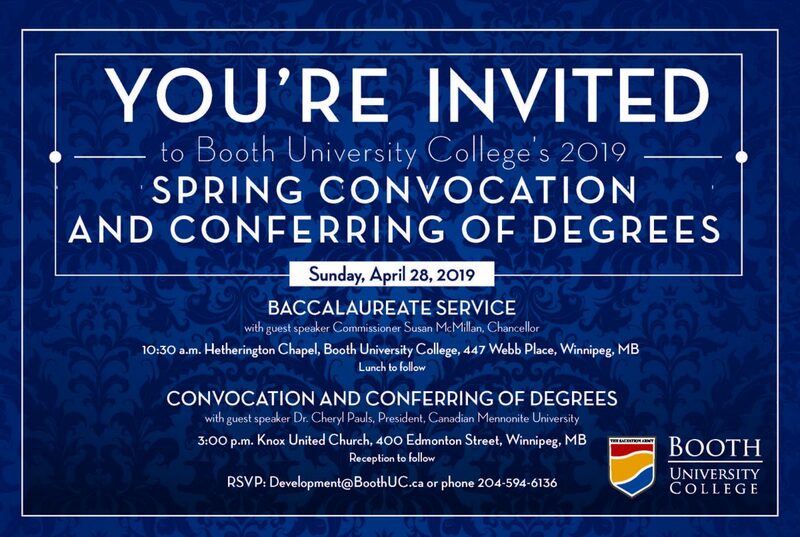 Baccalaureate Service, with guest speaker Commissioner Susan McMillan, Chancellor, Booth University College will be held at 10:30 a.m. at Waldron Building, 447 Webb Place, Winnipeg, MB. Lunch to follow. Convocation and Conferring of Degrees will place at 3:00 p.m. at Knox United Church, 400 Edmonton STree, Winnipeg, MB. The guest speaker will be Dr. Cheryl Pauls, President, Canadian Mennonite University. A reception will be held immediately following the ceremony, at Booth University College.